Z-Wave Plus Smoke Detector and Siren - 4001 from Popp. The 4001 Smoke Detector and Siren is designed to sense smoke that comes into the detector chamber. 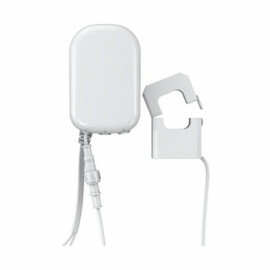 This device is a combination of a Z-Wave Sensor (Smoke) and a Z-Wave Actuator (Siren). The device is either powered by battery or can be powered by an optional external power supply. It supports secure communication and will automatically recognize other smoke sensors sharing alarm messages to cover the whole home. 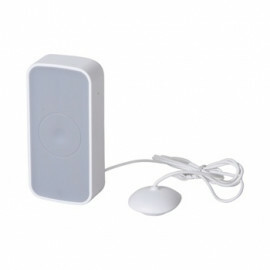 This product consists of a standard photo electric smoke detector with a pluggable Z-Wave Plus wireless interface module. 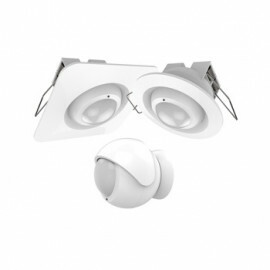 The smoke detector will also work as a stand alone product and is certified by VdS according to DIN EN 14604. The smoke chamber of the detector has a stainless steel reel with antistatic plastic chamber. According to VdS 3515 (smoke detectors with wireless communication) this device will automatically send alarm signals to all other POPP smoke detectors to turn on their siren. The same time all POPP smoke detectors will further relay the alarm signals to any other detectors in wireless range. 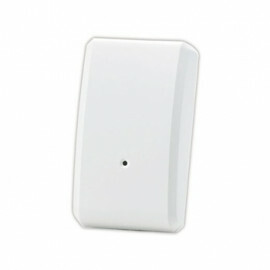 This function ensures that all smoke detectors will issue noise if one of them detected a smoke. Connection of the smoke sensors is fully automatical and needs no further configuration. Hi, in the descriptions is says "Additionally, the smoke detector contains a temperature sensor, which is used in parallel for detecting fires, avoiding false alarm and at the same time measuring the temperature in the room." I have bought a couple of these, and there is no temperature sensor.